Looks like the new Land Rover Defender's interior will have a cleaner, more modern design. Later this year, the all-new Land Rover Defender will debut to continue the iconic off-roader’s legacy with a fresh design and new advanced technology. 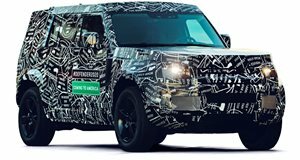 So far, Land Rover has released some official exterior shots of prototypes, but a leaked photo posted by a user on Twitter gives us a first look at the interior months before the reborn Defender’s big debut. If the image is legit, the new Defender’s interior will have a cleaner, more modern design with a widescreen infotainment display and a full-width digital instrument display with a similar layout to the new Evoque’s. Elsewhere, Defender branding has been applied to the steering wheel and passenger-side dashboard. In a quirky design touch, the accelerator and brake pedals also have "go” and "stop” wording. The rest of the interior looks incomplete, however, as the switches don’t have any labels, so we could be looking at an early mock-up that doesn’t represent the final design. Whatever the case, Land Rover clearly isn’t happy about the leak and is already publically threatening the user with legal action. The new Defender will arrive in two flavors: a smaller three-door 90 model and a larger five-door 110 model. Time will tell if the Defender 90 will be available Stateside since two-door SUVs don’t tend to sell very well in the US, which led to the death of the three-door Range Rover Evoque. Power is expected to come from a 2.0-liter diesel four-cylinder, with a hybrid variant expected to join the line-up at a later date. Rumors also suggest Land Rover is working on a pickup truck variant to rival the Jeep Gladiator, which was also available on the last generation Defender.